Never wonder what to make for a weekday breakfast again. I’m coming at you live from beautiful (rainy!!! first rainy day I’ve seen in like TWO years!) Santa Cruz, California with a recipe you will want to hold dear to your heart and never, ever forget. Promise? This recipe has changed my life. I’ve always been the type to rush through my weekday mornings, setting my alarm just early enough to get in a workout at the gym, shower, and make myself presentable for a 9-to-5 day in corporate America. Can anyone empathize with me on this? Since my morning is always so jam-packed, and I don’t feel like being jarred awake by my phone at 5am rather than 5:30am, I’ve always been the type to rush through breakfast. If you can even call it breakfast. 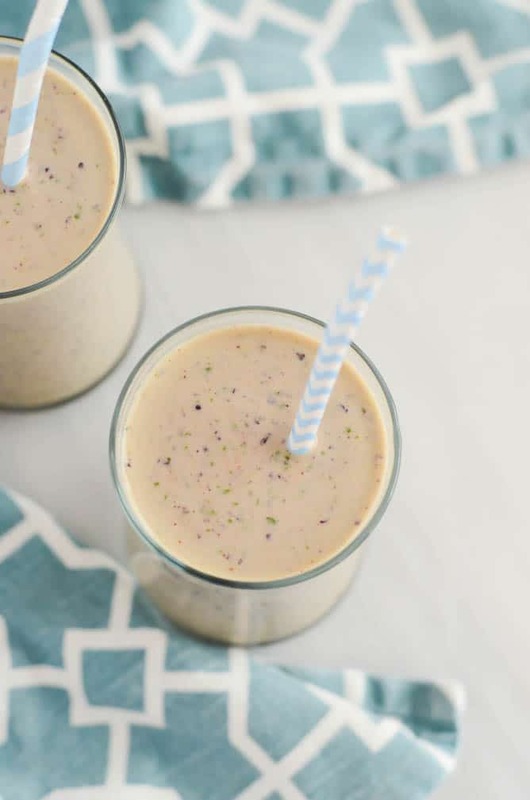 Before I created this smoothie recipe, it was more like “What can I grab that’s portable and eat-in-the-car-or-eat-at-your-desk-friendly.” You feel me? I would always grab a piece of toast or some fruit and Greek yogurt, shovel it in my face in a matter of 10 minutes or less, and be hungry again 30 minutes later, leaving me open to the perils of any coworker deciding to bring in donuts or homemade baked goods on that particular day. Not only was this not good for my energy levels, it wasn’t good for my waistline. My Christmas gift last year changed everything. 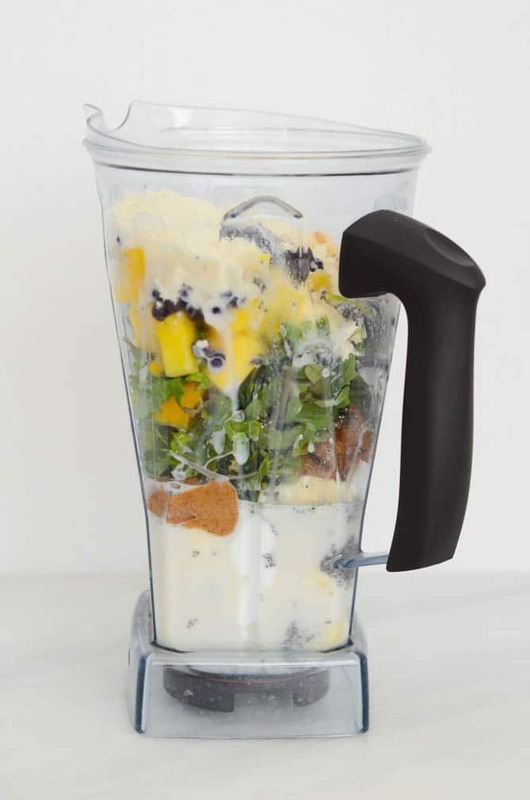 Say hello to Mr. Vitamix. [Any more creative names for this important part of my life now being accepted]. Not to mention my family deciding to take a week-long cruise through Tahiti in the summer…I decided I needed to shift my healthy eating into gear and decided the best place to start (especially with my new toy) was breakfast. It is the most important meal of the day, right? It took me a few tries to get a good recipe down, but since I’ve been making this smoothie five to six days a week for the past 10 months, I’m proud to say I’ve finessed it enough to have a pretty solid base to work with. Guys, this smoothie is BOMB. 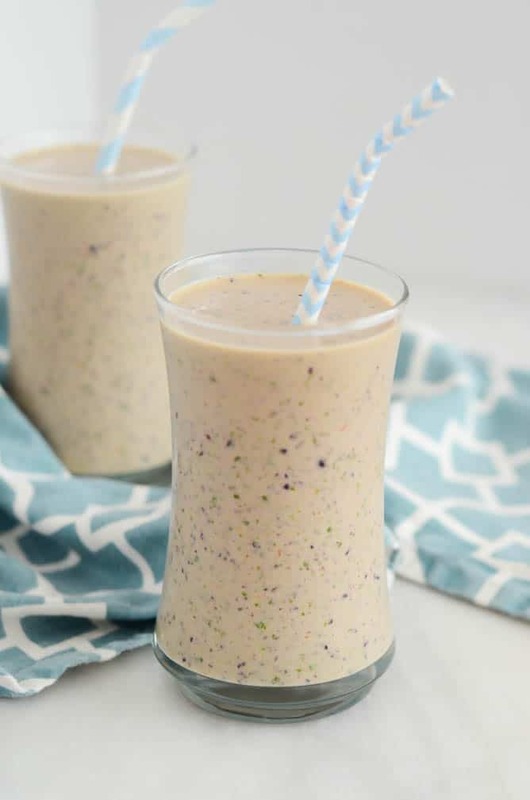 It’s healthy, covers multiple food groups (in just one Blender Bottle serving! ), and keeps me full until at least 11:00am. [For a girl that can usually eat every hour on the hour, this is a big deal.] The key is a healthy dose of protein and fiber – them’s stick-to-your-bones nutrients right there! 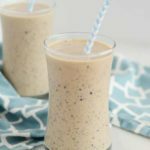 First, bananas and Greek yogurt go into the blender – I like forming a semi-solid base to make this smoothie nice and creamy! Next, of course we need our fruits and veggies. Baby kale (holla at Trader Joe’s for a pre-washed, pre-trimmed version – we’re all about ease and simplicity on weekday mornings) and your choice of frozen fruit (blueberries, pineapple and mango are my faves). 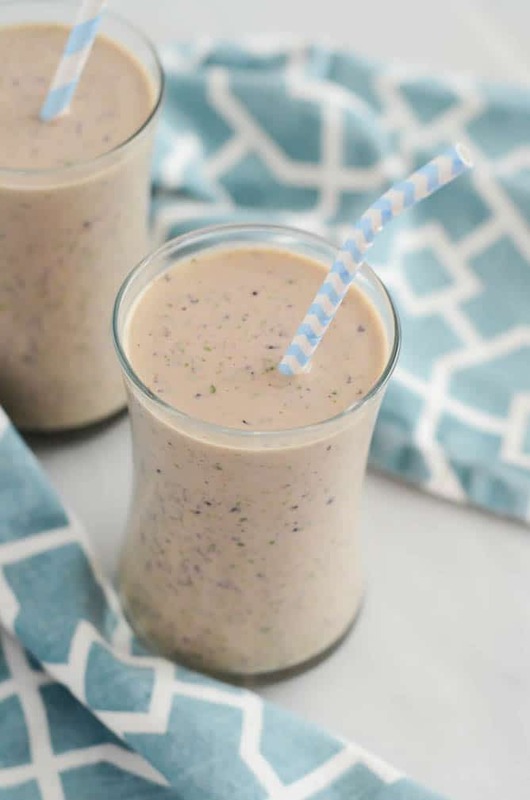 Next we amp up the stick-to-our-bones good stuff – protein powder and and Chia seeds. Side note: Does anyone have any good protein powder recommendations? I used to get the Whole Foods brand vanilla whey protein and loved it, but wanted to find something I could order on Amazon [I’m an Amazon Prime junkie]. I’ve tried a couple and am currently on the PlantFusion powder, but am still not sold – It blends well but has a slight artificial sweetener taste…Comment at the end of this post if you know of anything good! Finally, let’s loosen things up a bit with some almond milk. Then it’s blending time! This recipe is EXTREMELY versatile. There are endless opportunities for substitution. Switch up the frozen fruit, the type of milk (you can even add in some juice), or to make it more fall-like use some pumpkin puree! If you try this out and find a great alternate version, I’d love to hear about it. Place bananas, Greek yogurt and almond butter in blender. Add greens and frozen fruit. Add protein powder and Chia seeds.